Neil Dodd, a 23 year old grounds maintenance worker from Didcot was racing at Culham MX track with friends back in October. During his second race, Neil was thrown off his bike and knocked completely unconscious. He was then ran over by a bike behind him. A Marshall soon flagged the race and Neil was rushed to the local hospital where he spent hours having X-rays, blood tests and a CT scan. It was discovered that Neil had broken his forearm and fractured his wrist - ultimately needing surgery to fix it. Neil received surgery soon after and had a metal place along with 6 screws put in his arm. 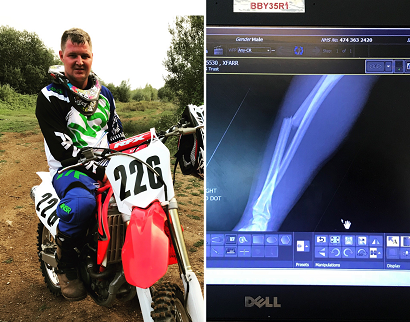 Luckily, Neil took out cover with Totally Sports last year when first taking up MX, and received several thousand pounds to help him with his recovery process. In his own words "Totally helped me by offering the best care and cover for the best price. They have supported me with setting up my cover and are very friendly and reassuring throughout the entire claims process."